Diaper Deal Favorite: Toys R Us: Pampers about $.22/diaper + 14 Gal Rubbermaid + $20 in coupons + Dry Max Samples! This works out to a little over $.22 per diaper and that's before any coupons and not including the extra Dry Max samples! In addition to the diapers, you get a 14 Gal. Rubbermaid Storage Bin and $20 in coupon savings. Nice! Hurry, quantities are limited and they are not offering rainchecks. And if you printed off your $5 gift card that I told you about here. You are in for a nice deal! 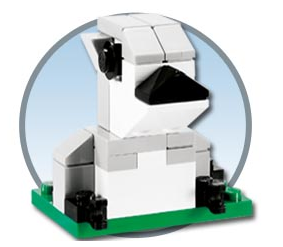 MOA - Build a LEGO Mini Model FREE! Feb. 2nd - Groundhog! AND FREE Kids Meal - AND FREE Kids Cocoa at Caribou! The LEGO Store Monthly Mini Model Build! One day each month you can learn how to build a cool LEGO mini model, and take it home – for free! February 2nd at 5 pm your child can build a groundhog mini model. For us MN's, we can go to Legoland at the Mall of America. Quantities are limited and offer is good while supplies last only. A new model will be available every month and will be specially themed to that month – ask a Store Associate for details! Models are not for sale and cannot be purchased. One free per child. Event is open to children aged 6 to 14 only. Check with your local LEGO Store for dates and times. Okay, Okay, I think the LEGO Groundhog is pretty lame looking. But, it's a nice FREE activity for you and your kids to enjoy together. What do you think? 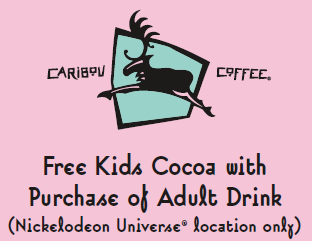 Or maybe after LEGO land you want to get a FREE Kids Cocoa (w/adult purchase) at the Caribou at Nicelodeon Universe (MOA). Grab a Toddler Tueday's brochure at one of the 4 main enterances (East, West, North, and South) at guest services. You will find in it variety of coupons (including the Caribou coupon for FREE kids cocoa). Check out the coupons at Coupons.com here for $2 off Maybelline New York Eye Studio Product and $2.50 off any John Frieda Luxurious Volume Product. Print now and keep your eye's peeled for sales. Update: Starting 2/7 Walgreens will have John Fieda hair care items at $5 each and you will get back $5 back in Register Rewards (like cash to spend at Walgreens) when you spend $15. Print off your coupons from the link above, here is another $5/2 coupon for John Frieda product at Smartsource. Final Cost = $.83 per bottle! Gotta love artscow. Again, they are offering up a sweet deal. Head over to artscow and get your photo coasters for $.99 + FREE ship! There is no limit on the amount you can order. If you order 4, your total would be $3.96 shipped. Enter code: DRK99SCT at checkout. Wouldn't Heart Coasters be cute for a Valentine gift? New Pampers with Dry Max FREE Sample and Chance to win FREE Diapers for a year! Score a FREE Sample of Pampers New Dry Max. 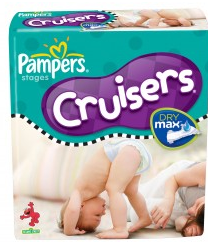 The sample includes a 3-pack of Pampers Cruizers with Dry Max to lock away wetness for (they say) up to 12 hours! Pampers.com should officially be offering this sample on their site tomorrow 1/29 but P&G Solutions has the offer up today. 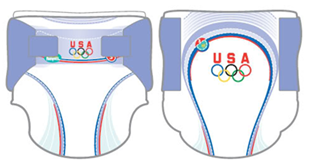 But that is not all folks, Pampers happens to be a sponsor of Team USA in the Winter Olympics this year and if you find a Team USA branded diaper in your sample pack, you will win a year's supply of Pamper's Diapers! What's not to like about that? I love this idea from SeeHere. The new Pages-in-Stages come with standard post binding so you can add or remove pages. You can also add your own scrapbook elements. 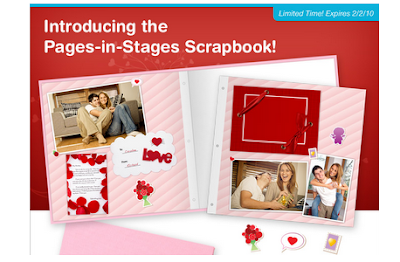 SeeHere is offering 35% off the scrapbook and the additional pages that go in it until 2-2-10. Use code: book-26 at checkout and get the 35% discount along with FREE standard shipping. Go to SeeHere.com and click on the photobooks section. Scroll down until you see the Pages-in-Stages Scrapbook. This is great for people like me who make a photobook and then say "Oops, I really would have liked to add this picture to my book" or "Oops, I miss spelled...". If I had used a pages-in-stages, I could just add, subtract, or redo a page. Nice. I am sure going to check this out! 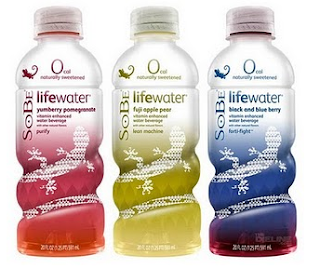 Get your Buy One Get One (BOGO) Coupon for SOBE Life Water (IE or Firefox). Target often runs buy 10, Get $5 gift card to Target. These coupons would work great in combo. Print the coupons now while they are available. I recommend the Acai Fruit Punch (0 cal.) Yummm! 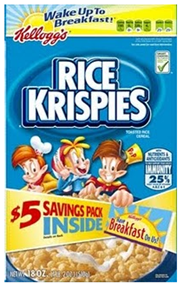 Keep your eye's peeled for these specially marked boxes of Kellogg’s cereals. They contain coupon booklets with (5) $1 off coupons inside of them! 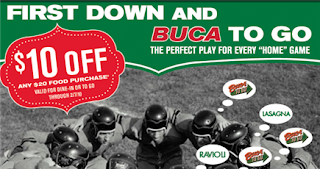 Get your coupon for $10 off $20 purchase at Buca di Beppo's. Expires 2-7-2010. I personally recommend the Chicken Marsala. Yummm! All You Magazine: $1 per issue - Packed w/ Coupons - Must Have! 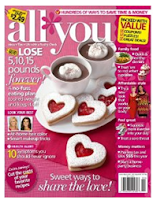 It seems that most deal sites recommend "All You" Magazine because it is packed with coupons. The only place you can buy this magazine on the newstand is Walmart at ($2.49/issue). You can Shop at Amazon.com and Get All You for $1 an issue. At Amazon, search All You magazine. Click on All You (2-year). You will see the price of $34/24issues. You will also see the $10 bonus offer that is available if you purchase before Jan. 31st. The certificate is good on future Amazon.com purchases. If you are not so sure that you want to commit to 24 issues. I suggest shopping through Shop at Home. Search for magazine.com. Once at magazine.com, search All You. Sign up for 12 issues for $19.97. You will get 30% cash back from Shop at Home on your purchase. This puts you at about $1.16/issue (after cash back). And if you are new to Shop at Home, you will get a $5 cash back bonus (that would put you at about $.74/issue)! 1. Coupons - You will never see a magazine with more coupons in it, not just money-saving coupons but coupons for FREE products and "free-after-rebate" forms. Most are manufacturer's coupons that you could use at any store. 2. 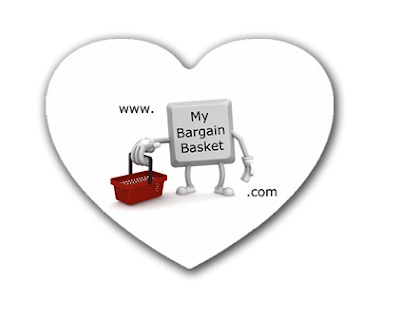 Articles - I always find at least one article that I want to read thoroughly, like the recent "Buy When the Price is Right" that talks about the best time of the year to bargain hunt for all types of things. 3. Rewards Readers - You can sign-up to be an All You Reality Checker and get special offers (like a free hotel stay in exchange for sharing your opinion) and surveys (they've offered cash in the past for reader surveys). This magazine is different from all the rest because they actually want and use reader input. They reward those readers too! Findng Pennies got to test-drive (and keep) a $300 vacuum cleaner! 4. Get it by mail - I don't have to drive anywhere to get my copy of this magazine and I get it faster than my local Walmart store puts it on their newstand. This saves me time! Physicians Formula: FREE after Rebate (New 2010 rebates)! Look for the pink "Try Me Free" peelie rebate form on Physician Formula makeup packages. You can print the forms here but you must include the peelie in order to get the rebate (along with the origional sales reciept). With all of the free samples of "sanitary products" lately, who needs to buy 'em next month? 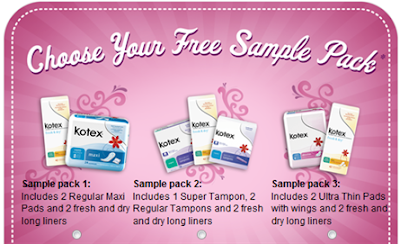 Get your FREE sample pack of Kotex here. Diapers.com: $14.97 rebate and $10 off your first order & FREE Ship for Orders over $49! Wow. Get your diapers and everything delivered right to your doorstep! $10 off your first order. Enter Referral code SHER7732. Free shipping for orders over $49. Plus, if you shop through ebates, you will get paid back 1-4% on your orders. If you are new to ebates, you will get $5 cash back for sign up. Registration is free. Fill out the rebate form Here for $14.97. This is for First time customers only. Now you can choose to get the Parenting magazine or $14.97 rebate (See the last paragraph on how to get the rebate). Babies R Us: FREE $5 gift card when you become a fan! -Hurry, while supplies last. Become a fan of Babies R Us on Facebook and get a $5 eGift Card Today Only! 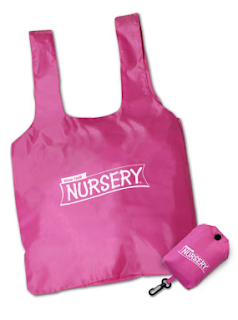 Nursery Water will give away 100 Pink bags per day here while supplies last. They list how many are available for the day on their site. You better be an early bird if you want to catch one of these bags. 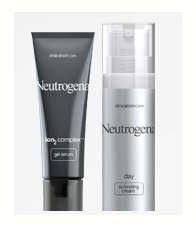 Neutrogena Clinical $15 Rebate and $5 Printable Coupon! Buy any Neutrogena Clinical product by 4/30/2010 and get $15 rebate. Print and follow the guidlines on the Neutrogena rebate form here. Print off a $5 coupon for Neutrogena Clinical Here. Hit the back button to print twice. This product is NEW and may not be in your local stores yet. It is due at Walgreens on Jan. 29th. I suggest printing out the rebate form and the coupon now as they may not be available later. I'm sure that with the product just hitting the stores, there will be some great promo pricing. The individual treatments retail for $39.99. Keep your eye's peeled for a good sale. If you can find it for $20, your product would be FREE (after rebate and coupon). 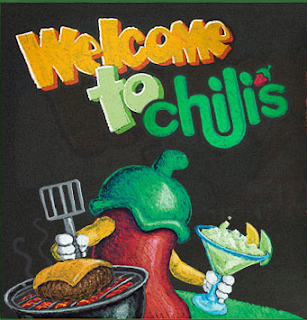 Join Chili's E-Mail Club and get a FREE order of Chips and Queso. Yummm! Don't really want to clutter your inbox? Create a free e-mail account at Yahoo for all of the e-mails that you don't necessarily want to read right away (or at all). 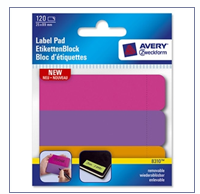 Get your FREE sample of Avery Label Pads From the Box Tops 4 Education Site. I love these little self-adhesive labels. They help me in organizing my coupon files! 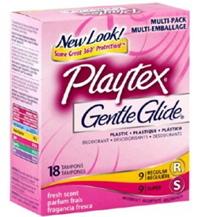 Get your FREE Sample of Playtex Here. Sample includes 3 regular unscented tampons. 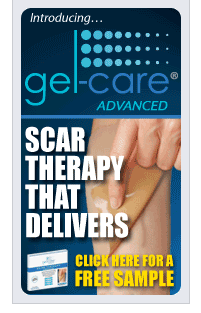 Get your FREE Sample of Gel-Care Advanced Scar Treatment Sheet sample Here. Restaurant.com periodically runs 80% off deals and now is one of those times! Get $25 gift certificates and pay only $2. Use promo code: BONUS (exp. 1/31). This is a great deal folks. Stock up. The certificates do not expire for a whole year from the date of purchase. If you eat out a lot, you might consider the Dinner of the Month Club. It's a 12 month package. It comes with 12 $25 certificates and one FREE $50 certificate. After you type in code: BONUS, your total is just $24. Yep, I said $24! That's $350 worth of dining certificates for only $24! Side Note: Be sure to read the terms for each restaurant that you choose. 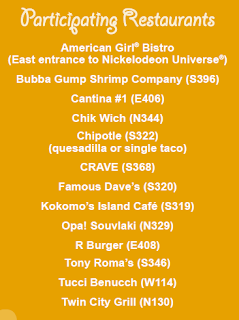 Terms vary between restaurants. ADULT & Childrens fleece $3.99 + 15% off + Cash Back at The Children's Place! 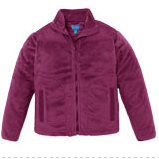 The Children’s Place has Adult and Children’s Fleece jackets down to $3.99 HERE. Use code E79AA at checkout to take an extra 15% off. Plus if you shop through ShopAtHome you will receive a 5% cash back rebate. If you haven't signed up for Shop at Home yet, you can get a $5 cash back for sign up. Looking for Gluten Free samples and coupons? Join Gluten Free Circle here for free. 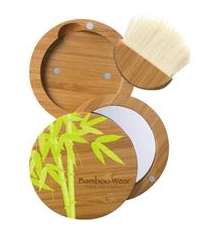 Bath & Body Works: Clearance up to 75% off + Extra 20% code! 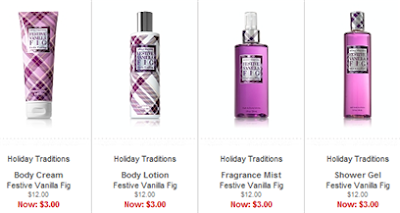 Bath & Body Works has clearance up to 75% off. Apply code: INSTYLE20 to take an extra 20% off at checkout. They have many sale items. 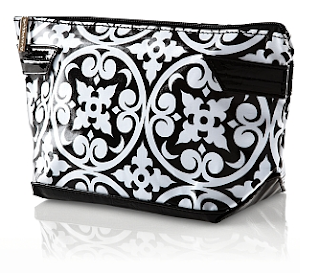 I thought the cosmetic bag below was cute. It's normally priced at $14.50. Get it now for $4 (after extra 20%). Too Cute! 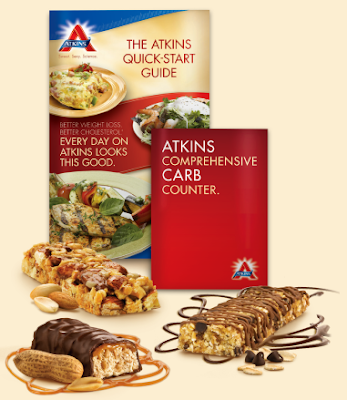 Atkins: FREE Atkins Bars, Carb Counter and Quick Start Guide! Get your FREE Atkins Bars (3), Carb Counter and Quick Start Guide Here. Dairy Queen: 6 Buy One Get One FREE Blizzard Coupons! 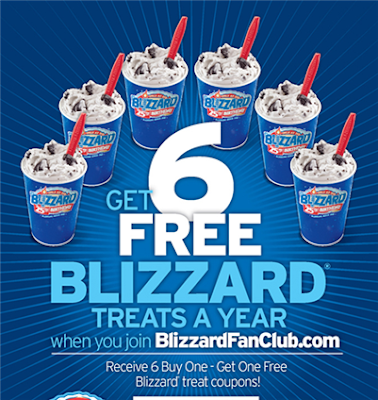 Dairy Queen is offering a great deal Here for joining the BlizzardFanClub.com. For joining, you will get 6 Buy One Get One FREE Blizzard Coupons. You should recieve the first coupon right away and the other 5 throughout the year. 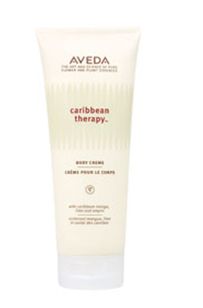 Aveda: FREE Sample of Aveda Caribbean Therapy Body Creme! Get your coupon for a FREE Sample of Aveda Caribbean Therapy Body Creme here. Offer expires Feb. 1st. and is while supplies last. The salons that are attached to the mall seem to run out of these samples first. You might have better luck trying a salon outside the mall. 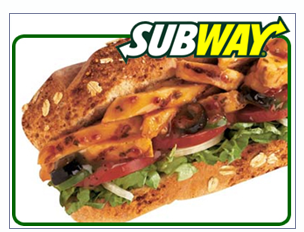 Get your coupon for a FREE 6 inch Subway Sub here with the purchase of another of equeal or greater price and 32oz drink. ** I've read reports on the web that this site is glichy. This has been going right through for some people, and others have not been able to get through at all. Just an FYI. Hurry - FREE Oreo Cookies - First 150,000 packages - Become a fan of Oreo on Facebook! Oreo is offering FREE Package of Oreo Cookies (Looks like the Golden Stuf). Become a fan of Oreo on Facebook here. Then fill out the form for your free package of Oreo's. Your coupon will be mailed to you. 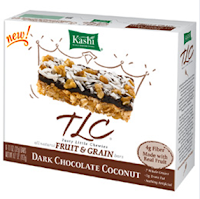 Get your FREE Sample of Kashi Cereal or Bar Here. Jolly Time: FREE Tote Bag with just 3 proof of purchases from Jolly Time Micro Popcorn! 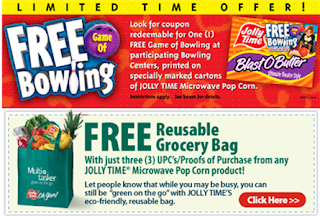 FREE Tote Bag from Jolly Time with 3 proof of purchases from Jolly Time Microwave Popcorn. You can also score a FREE game of Bowling on specially marked boxes. Shutterfly has a sweet sale going on now. They have up to 50% off Valentine's Day offers, Plus an extra 20% with code: SWEETDEAL. Plus FREE Ship for orders of $30 or more with code: SHIP30. Plus 3 FREE greeting cards with code: 3FREECARDS. Also, if you have the $10 Shutterfly credit that I told you about Here. You're in shape for an awesome deal. I would also like to point out that they have 25% off CenterStage books (which you can use the extra 20%off on). We ordered the Dora book for my little Dora fan and I was very pleased with quality. 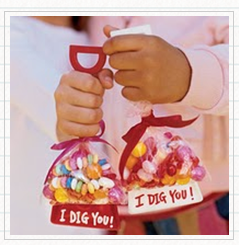 Valentine Craft for Kids or Mom: Shovel of Candy -- I Dig YOU! Check out how to make this at A Very Country Christmas. I don't know where you find shovels in MN at this time of year (unless it's a snow shovel) but, I thought these were so cute. I might have to stock up on some plastic shovels in the summer and do this project next year. 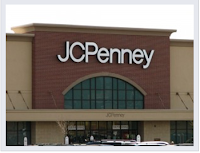 Just like Old Navy, sounds like JCPenney is now reducing their clearance to an additioanl 50% off. 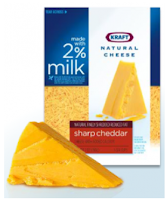 Print your Kraft Cheese $1/2 coupon here. These won't last long. Cheese...Ymmmm! Get your coupon here for $10 coupon for Eukanuba Dog Food. Scroll down to the bottom of the page. Hooked on Phonics Clearance Sale w/ additional 50% off code! Yeah! 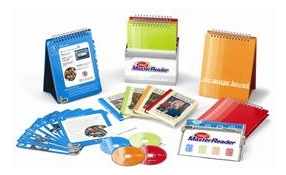 There are a ton of new products in the Hooked on Phonics overstock area- including the Master Reader for kids 7 and up for $59.95 (normally $199.95)! Use code: SLICK50 and get 50% off that! There are a lot of items to choose from for pretty much all ages, including the toddler reading kit for $26 and some of the great workbooks for about $2. You will also find languages and math tools! I was able to purchase a much needed Hooked on Math Addition and Subtraction for $7.95 (normally $34.95). The Discover Reading Baby is less than $8 after discount as well! 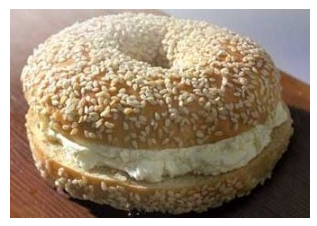 Sign up to receive emails from Bruegger’s bagels and you’ll be emailed a coupon for a free bagel with cream cheese. Of course you’ll get other coupons and offers over time, but I’m motivated by one free breakfast, if nothing else. To avoid cluttering up your inbox with emails from companies, set-up a second email account that you use excluively for these kinds of things. 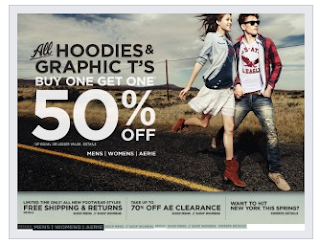 American Eagle has FREE shipping thru Tuesday, Jan. 26th. No code needed (the discount will not show up until the end of checkout). Shop through Ebates and get 3% cash back on your purchase. New members will recieve a $5 sign up bonus. Sally Hansen Natural Beauty Products: $3/1 coupon! Print out your coupon for $3/1 Sally Hansen Natural Beauty Products IE or Firefox.